Permanent raised beds (PRB) and controlled traffic broad acre farming are a recent phenomenon in southern Australia, developed to overcome waterlogging and improve soil structure on cropping soils in the high rainfall zone (> 550 mm) of southern Australia. 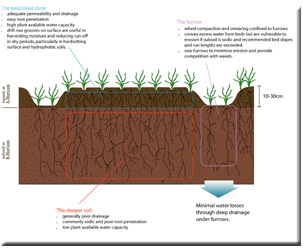 During the long, cool growing seasons, perched watertables can develop following rainfall due to the high clay content and low permeability of the subsoils, often resulting in complete crop failure when grown on flat or gently sloping ground without drainage. Raised Bed Farming is not a new idea. In Asia and other parts of the world, soil beds have been raised and furrows used for irrigation for centuries. In many countries including Australia, the technique has been used for many years by home gardeners and commercial vegetable and flower growers to assist with drainage. In the early 1980’s, scientists from the former Department of Primary Industries (DPI) Tatura, in Victoria developed a system of growing broad acre grain crops on raised beds and using the furrows for irrigation (Tisdall and Adem, 1986a, 1986b; Tisdall and Adem, 1988). The system has been widely adopted for grain and horticultural crop production in the NSW Riverina districts, particularly around Griffith (Beecher et al., 2005). Figure 1. A profile of a typical raised bed. Permanent raised beds were developed for broad-scale dryland agriculture by the Southern Farming Systems (SFS) in the mid 1990’s. The work was based in south west Victoria and was led by Bruce Wightman from the former DPI. Typically, the soil is cultivated to depths of up to 30 cm and then formed into narrow beds of between 1.7 to 2.0 m in width. Soil from the furrows positioned down each side of the beds is thrown onto the tops of the beds, resulting in an increase in the height of the soil of between 2 and 5 cm. The height of the bed above the furrow base is usually between 15-30 cm, depending on the depth of the prior cultivation. The furrows act as pathways for drainage, providing there is some slope in the paddock to allow water to run down them, and they also carry wheeled traffic to minimise compaction within the bed. In the system adopted in south-west Victoria, crop is generally sown in the furrows without fertiliser, to minimise erosion and reduce nutrient loss in runoff. If the beds are properly installed in the first instance, the beds should only require reforming every 3-5 years. 1. Better drainage: Raised beds are primarily a field drainage tool aimed at decreasing waterlogging and increasing crop yields. When soil becomes saturated with water, as is the case for many ‘texture contrast’ soils in Australia, anaerobic conditions result in poor plant root growth, causing plants to become stressed and in some cases under prolonged waterlogging, plants will die. Where soils become saturated in winter due to high rainfall and/or poor drainage, then soil drainage needs to be considered. 2. Better soil structure: By their very nature, raised beds encourage implements to travel down the furrows, which reduces the amount of soil compaction occurring where the plants are growing. Soils that aren’t compacted have a greater ability to hold plant available water, are less cloddy, allow for greater plant root growth and give higher plant yields. Raised beds offer a form of controlled traffic, the benefits of which have been proven in many areas and over many years (Blackwell et.al.,2003; Ellis et.al., 1992; Tullberg, 2001; Tullberg et.al., 2001). 3. Risk management:: The incorporation of raised beds means that the complete failure of crops due to waterlogging is eliminated. Hence more accurate budgeting of crop yields can occur, with greater confidence in achieving good crop yields. Many paddocks that were once too risky to crop due to waterlogging problems can now be brought into production with confidence. 4. Higher profits: Due to more uniform and higher yielding crops under situations where waterlogging would normally be a problem, higher profits can be realised. Crop yields in many parts of South-west Victoria have doubled in recent years where raised beds have been used. A doubling of yields has meant considerably more profit for farmers using raised bed technology. It is important to note that many of the costs associated with the installation of the raised beds, such as surveying, grader work etc. are one off costs and should not need to be repeated. The rapid research and development of raised beds and controlled traffic has been a combined team effort including farmers, machinery manufacturers, agronomists, and researchers with the Grains Research and Development Corporation (GRDC) (external link) and SFS helping to sponsor the project along the way. A range of practices and recommendations have been developed by the SFS group over the years for the establishment of raised bed systems in southern Australia. As a consequence of the SFS being a farmer partnership, a lot of the research underpinning these practices was carried out in an on-farm, participatory mode. The paper below describes the PRB systems developed for conditions prevailing in southern Australia. Beecher, G. Thompson, J.A., Dunn, B.W. and Mathews, S.K. (2005). Permanent Raised Beds in irrigated farming systems in the Murrumbidgee / Murray Valleys of NSW. ACIAR Proceedings No. 121., Griffith, Australia, 1-3 March 2005, p129-143. Ellis, T.W., Sedaghtpour, S., Thomas, J. (1992). Three years of controlled traffic cropping at Roseworthy. Conference proceedings Engineering in Agriculture. Albury. New South Wales. P109-114. Tullberg, J.N. (2001). Controlled traffic for sustainable crop production. Proceedings of the 10th Australian Agronomy Conference. Hobart. 29th Jan to 1st Feb 2001. Tullberg, J.N., Ziebarth, P.J. and Yuxia Li. (2001). Tillage and traffic effects on run-off. Australian Journal of Soil Science 30: 249-257. Hi-Grain Update Research News - Research to profit high rainfall temperate zone grain growers with useful fact sheets on raised bed cropping. Bedtime Stories - A networking newsletter for Australian bed Farmers, a joint publication from GRDC, the former DPI and Southern Farming Systems.